My daughter, Sarah, is 17, but we still receive the American Girl doll catalogue. Imagine my shock when I saw that Molly McIntire and her English friend, Emily Bennett, were to be “archived.” I guess that means they’ll be shelved for now. I’ve always had a fondness for Molly since her story is set in 1944 and her home front hi-jinks appealed to me. Yes, yes, I know how commercial it all is, but there’s a part of me that is glad girls associate historical fictional girls from the past with narrative. Molly McIntire and Emily Bennett, her English friend escaping the London Blitz. 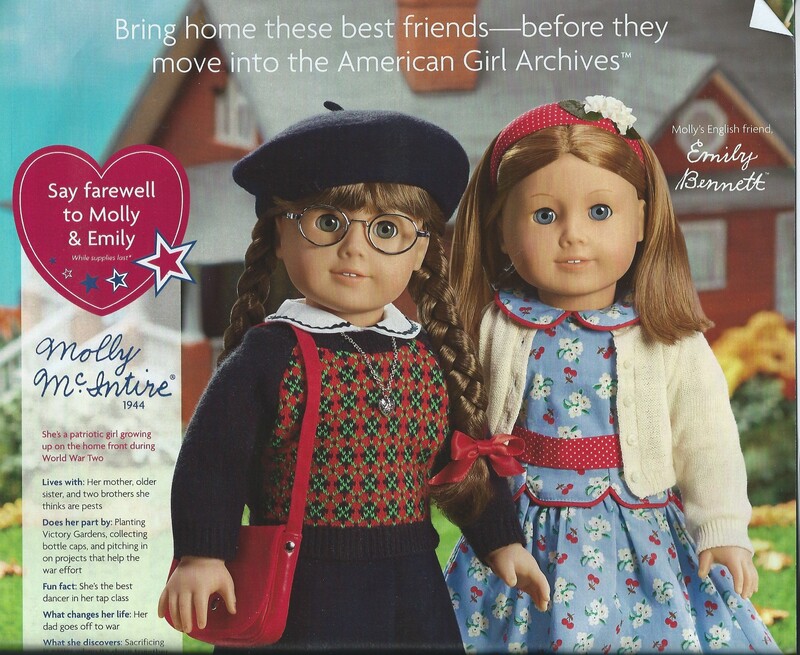 I first encountered the American Girl doll phenomenon through two girls we knew when Sarah was very little, Jenny and Molly Odintz. I think they had a doll or two, though they giggled over the unlikely ability of Addy, the escaped slave, to own $30 accessories! And they dearly wanted a Jewish doll which American Girl finally provided. 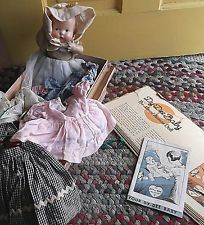 Sarah got some American Girl dolls from Joan, her grandma–Kit Kittredge, the 1930s doll, and Samantha, a girl from a “bright Victorian beauty.” Sarah was never that much into them, but they still sit atop her bookcase. She even has that English girl who has fled the Blitz, Emily Bennett! The Four Fates, as my husband, Jim, likes to call them: Emily, Kit, a doll from Poland, and Samantha. A little stuffed bug (representing the disease ‘mono’) sits in front. Dolls are wonderful beings, though I think Sarah’s and my interest in American Girl dolls dissipated when we visited the actual American Girl doll store in New York City a number of years ago. The scary intensity of the buyers with their brutal focus on consumption turned us off, though we had many a giggle over it! Dolls are important for girls to learn to express themselves. I often acted out stories with my dolls and stuffed animals. In 3rd grade, my teacher let me perform little plays for my classmates using my stuffed animals and troll dolls. I also had Barbies, though Barbies were for older girls in those days, while little girls receive the physically impossible plastic siren today. 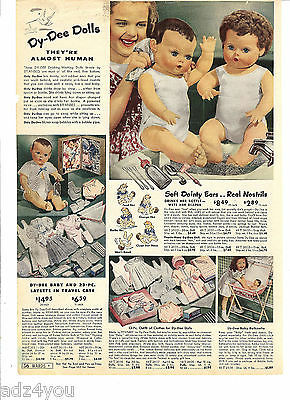 Joan writes about wanting a doll when she is almost fifteen.
. . . Last week Mrs. Topping read my “Lonesome Pine” composition to the class and said it was writing at its best. Ah! Then she asked the class if they didn’t feel something good in it—so they said “no,” but Mrs. T. appreciates me—I hope. . . .
Last Saturday I went downtown and saw Santa Claus, etc. They’ve got the cutest dolls there—I want one for Xmas even if I am almost fifteen—but I want a set of O. Henry, too—even more. Honestly, I’m practically a little girl when it comes to Xmas displays. I’ll stand for an hour and watch someone demonstrate “DyDee” dolls or something. A few months later, a wonderful gift arrives for her.
. . . Last week Vera and I went to Mary’s house and I fell in love with her ragdoll, and when the club met there Friday, I found a doll there with a card saying “To Joan Whalen [sic]—my name is Penelope and I am a platinum blonde” and Mary really had made one for me—I think that was nice of her.
. . . One girl had a Dionne quintuplet doll in art and I had the best time playing with it. Everyone was teasing me about second childhood. Have I passed yet from my first? 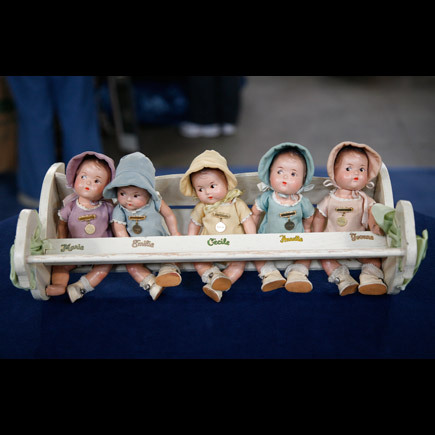 . .
 Canadian quintuplets born in 1934. Later on that year, Joan expresses something I think all girls with dolls can empathize with. I wish someone wanted me. Penelope [my doll] loves me and Tristan [my plant]. Good night. Joan even writes a poem to her doll when she is 15. In my possession of you. I hope each girl in the world may have or receive a doll–her dearest friend. Posted in Susie's Blog and tagged American Girl Doll, dolls, O. Henry, The Gift of the Magi. Bookmark the permalink. I love this story,it is so cute. The dolls are very pretty. I had (and still do) American Girl Dolls when I was young. Molly was the first I got, when I was around 7 or 8. I was a mousy little girl with big glasses, and Molly just looked like me. I later had Samantha, Felicity, and Kirsten. 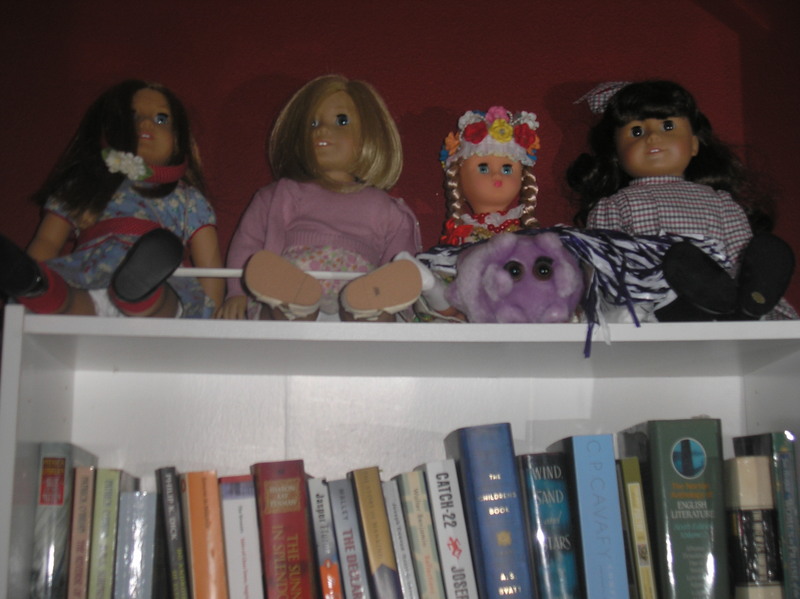 I loved reading their books and playing with the dolls. And I credit knowing about factory workers and child labor laws to Samantha’s books. Yes, the American Girl dolls are terrific for learning about history and getting girls interested in it!